Wind farms are built offshore to take advantage of strong coastal winds. But scientists have learned that there is an unexpected environmental price to pay for these environmentally-friendly energy generators: the farms are causing havoc for the ocean's food chain. 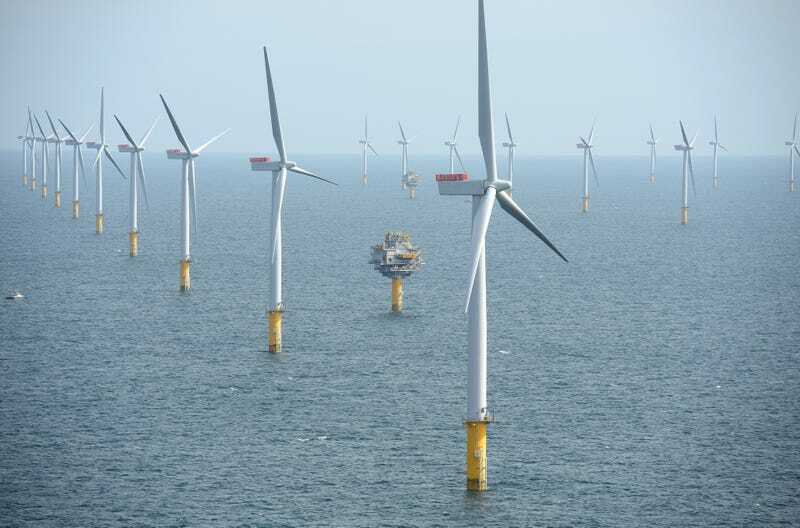 When fastened to the ocean floor, wind farms sometimes act as artificial reefs that serve as a home for invertebrates, which attract predatory fish, which, in turn, attract seals, which gobble everything in sight. Deborah Russell of the University of St. Andrews, explains that one of two situations could have created this buffet. First, the structures could have simply attracted prey that would otherwise have been spread sparsely across the region, leaving the overall mass of living animals in the ocean unchanged. Alternatively, the structures could provide a protected area, increasing overall amounts. If the seals are encountering a concentration of prey rather than increased prey overall, says Russell, these snacks are "very vulnerable to be Hoovered up." "Because everything is so linked, if the seals are Hoovering up a prey species, that will have effects on other predators, other prey of those prey," Russell explains. But even if the opposite scenario is true and the prey animals are thriving in the protection of the structures, the balance in the ecosystem could still be thrown off. "It's all very linked and the food web is very complex," says Russell. "There can be quite a big effect of a disturbance in one area of the system."